Kundalini, literally translated as "coiled," is the name of the source and origin point of energy flow within your body. 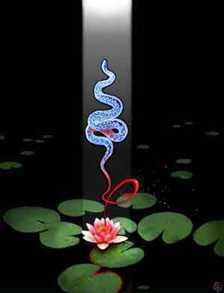 In most people, kundalini stays coiled at the root chakra located in the base of the spine. In times of sexual excitement, this powerful energy rises to the second chakra. The practice of kundalini yoga is the art of consciously extending the kundalini pathway all the way up to the crown chakra, located at the top of the head; thus enabling the free flow of cosmic energy throughout the body as needed. Kundalini is classically visualized as a snake coiled about the spine; as a conscious exercise, you may wish to imagine a cobra raising up its head as it flexes its muscles and raises its head to eye level... as you do this, straighten your own spine and feel the energy coursing up and down through your nervous and circulatory systems.